GST is a self-assessed destination based taxation system. The submission and processing of return is an important link between the taxpayer and tax administration. This document lists out the salient aspects of the process related to filing of GST returns. Who needs to file Return in GST regime ? However, State tax authorities may assign Departmental ID to such government departments / PSUs / other persons and will ask the suppliers to quote this ID in the supply invoices for all inter-State purchases being made to them. Filing of returns would only be through online mode. Facility of offline generation and preparation of returns will also be available. The returns prepared in the offline mode will have to be uploaded. Eight different types of Returns are prescribed viz. GSTR 1 to GSTR 8; Types of taxpayers for every return and the periodicity of return for different categories of taxpayers is as follows..
GSTR-3 (monthly Return) for each registration. Normal / Regular taxpayers with multiple registrations (for business verticals) within a State would have to file GSTR-1, GSTR-2, GSTR-3 and GSTR-8 (Annual return) for each of the registrations separately. Casual/ Non - Resident Taxpayers (other than foreigners) would have to file GSTR-1, GSTR-2 and GSTR-3 returns for the period for which they have obtained registration. The registration of Casual/Non –Resident taxpayers will be done in the same manner as that of Normal / Regular taxpayers. Gross Turnover of the Taxpayer in the previous Financial Year. This information would be submitted by the taxpayers only in the first year and will be auto-populated in subsequent years. For all B2B supplies (whether inter-state or intra-state) invoice level specified details will be uploaded. For all inter-state B2C supplies – invoice level details to be uploaded for invoices whose value is more than INR 2,50,000. For invoices below this value, state-wise summary of supply statement shall be filed. Following parameters with respect to HSN code for goods and accounting codes for services will apply for submitting the information in return relating to invoice level information. > HSN code (4 digits) for goods and accounting code for services will be mandatory initially for all taxpayers with turnover in the preceding financial year above INR 5 crores. > HSN codes (8 digits) and accounting codes for services will be mandatory in case of exports and imports. Details relating to advance received against a supply to be made in future will be submitted in accordance with the Point of Taxation Rules as framed in the GST law. Details relating to taxes already paid on advance receipts for which invoices are issued in the current tax period will be submitted. Separate table for submitting details of revision in relation to outward supply invoices pertaining to previous tax periods. Separate table for effecting modifications/correcting errors in the returns submitted earlier. The information in GSTR-1 shall be auto-populated in concerned tables in GSTR-2. It can be modified by the taxpayer while filing GSTR-2. The details of inwards supplies would be auto-populated in the Input Tax Credit (ITC) ledger on submission of return. GST law should provide that ITC with respect to capital goods will be allowed over a period of 2 years in equal instalments. Further GST law should make appropriate provisions for availment of ITC in case of inputs received in one lot or in multiple lots. Separate table for submitting details in relation to ITC received on an invoice on which partial credit has been availed earlier. Separate table for ISD credit and TDS credit received by taxpayer. It would capture the aggregate level outward and inward supply information which will be auto populated through GSTR-1 and GSTR-2. 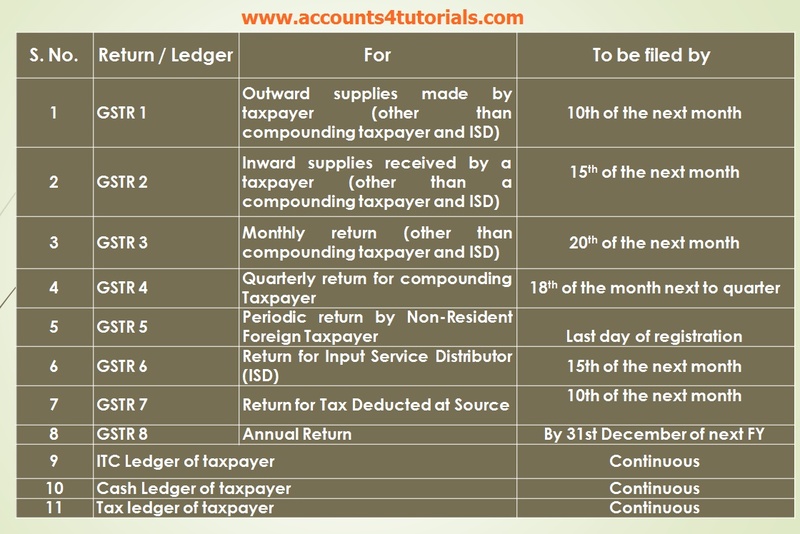 Information about ITC ledger, cash ledger and liability ledger would be updated in real time on an activity in connection with these ledgers by the taxpayer. Details of payment of tax under various tax heads of CGST, SGST, IGST and Additional tax separately would be populated from the debit entry in credit/cash ledger. GST law may have provision for maintaining 4 head-wise account for CGST, SGST, IGST and Additional tax and at associated minor heads for interest, penalty, fee etc. Taxpayer will have the option of claiming refund of excess payment through the return for which appropriate field will be provided in the return form. Details of ITC balance (CGST, SGST and IGST) at the end of the tax period will be auto-populated in the ITC ledger irrespective of mode of filing return. The return would have a field to enable the taxpayer to claim the refund or to carry forward the ITC balance (CGST, SGST and IGST). GST law may provide that the refund will be processed quarterly. It will be auto-populated through GSTR- 1 (of suppliers), own GSTR-2, ISD return, TDS return of deductor, own ITC ledger, own cash ledger and own tax liability ledger. All the normal taxpayers would be required to submit annual return. This is intended to provide 360 degree view about the activities of the taxpayer. It is a detailed return and captures details of all income and expenditure of the taxpayer and regroups them in accordance with the monthly returns. This return will provide the opportunity to make good for any short reporting of activities undertaken supply wise. It is to be submitted along with the audited copies of the Annual Accounts and should be filed by 31 December following the end of the financial year for which it is filed. A separate reconciliation statement, duly certified by a Chartered Accountant, will have to be filed by those taxpayers who are required to get their accounts audited under section 44AB of Income Tax Act 1961. Consolidated statement of purchases and supplies based on monthly returns filed by the taxpayer can be made available to taxpayers by GSTN common portal as a facilitation measure for enabling him to prepare annual return. Upload final GSTR-1 return form either directly through data entry at the GST Common Portal or by uploading the return through Apps by 10th day of succeeding month. The increase / decrease (in supply invoices) would be allowed, only on the basis of the details uploaded by the counter-party purchaser in GSTR-2, up to 17th of the month. GST Common Portal Network (GSTN) will auto-draft the provisional GSTR-2 of taxpayer based on supply invoice details reported by the supplier on a near real-time basis. Purchasing taxpayer will accept / reject / modify such an auto- drafted provisional GSTR-2. Taxpayer will have the option to download his provisional purchase statement from the Portal or through Apps using Application Programming Interface (APIs) and update / modify it offline. Purchasing taxpayer can also add additional purchase invoice details in GSTR-2 which have not been uploaded by the supplier, provided he is in possession of valid invoice and has actually received such supplies. Taxpayer will have the option to reconcile inward supplies with their suppliers. All the invoices will be auto-populated in the ITC ledger of the taxpayer. The taxpayer is however, required to indicate the eligibility/partial eligibility of ITC. Taxpayer will finalize their GSTR- 1, GSTR-2 through online facility at Common Portal or GSTN compliant offline facility in their accounting applications. Taxpayer will then pay the amount as shown in the draft GSTR-3 return generated automatically at the portal. 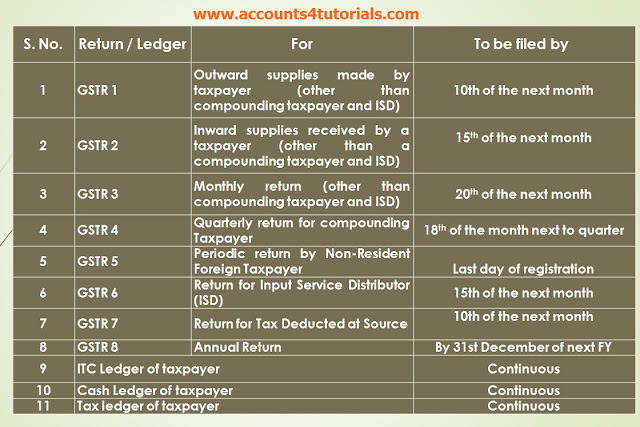 Taxpayer will debit the ITC ledger and cash ledger and mention the debit entry No. in the GSTR-3 return and would submit the same. Final acknowledgement of receipt of return will be generated after submission and validation of data is completed. details such as HSN code for goods and accounting code for services, place of supply also have to be given for B2B supplies and inter-state B2C supplies. The ITC claim will be confirmed to purchasing taxpayer in case of matched invoices after 20th of the month succeeding the month of the tax period month provided counterparty supplying taxpayer has submitted the valid return (and paid self-assessed tax as per return). Here in the proposed system monthly return GSTR-1, GSTR-2 and GSTR-3are proposed which will be time and manpower consuming. Also proposed are three different datelines? One return by 10th, next by 15th, and final return by 20th. This will be extremely time consuming and will discourage people to get into Business. In the proposed GSTR-1 & GSTR-2 supplier need to mention the Invoice No, date and HSN/SAC. However, one invoice may have multiple goods of same or different HSN and invoice may have run into several pages. Further, one invoice may have goods as well as freight which is a service. In the circumstances how assessee will fill the multiple HSN/SAC code in a single line and if the system allows several lines for one invoice, return may run into several pages. In view of above, it appears that the system is extremely time consuming and will result in only mismatches and will make return filing as most difficult and there will be very difficult of doing Business. In the proposed GSTR -1 supplier need to mention the Transaction id (A number assigned by the system when tax was paid advance received) for adjustment of tax paid on advance received. However, adjustment of advance tax may have different invoices raised, as whole advance may not be applicable for one invoice. And filling same transaction id for different invoices in the same return or in subsequent return will result in mismatches and will make return filing as most difficult and there will be very difficult of doing Business. At present non payment of tax liability of seller imposes no liability on purchaser. In this proposal, purchaser is fully liable for the tax payment of seller. It appears that revenue wants to put entire burden of tax collection on purchasers. Tax collection from any supplier should be the responsibility of tax authorities. The present proposal is extremely faulty. Collection of Tax from any assesses is the responsibility of Tax Authorities. While it is proposed that the input tax credit balance will be auto- populated at the end of the tax period in the ITC ledger, the issue relating to treatment of credit balance during the transition will need to be addressed. In proposed GST, Sales Tax Practioners (STP) who are present doing most of the compliance under the STATE VAT acts are not recognized to issue Annual Return GSTR-8 in respect of assesses covered by Tax Audit U/s 44AB of Income-Tax Act, even though the returns are proposed to be filed by STP/TRP.